Can we have different sets of filters to manage accounts differently? Yes! This is one the primary benefits of using InsideView Refresh. For example, you can have one filter that manages 5,000 accounts, set to run once per month, and update 5 fields. Then, a second filter, that manages 4,000 different accounts, set to run daily and update 10 fields. Note: An account may only belong to any one filter. How to add multiple values to a single field when I’m building a filter? No you cannot cannot enter multiple values in this release. If I change the filter while it’s running, how will that affect the job? We strongly advise against changing a filter while it is running. This has the potential to cause the filter to fail, or give partial results. How does matching works and what data is matched? What fields does InsideView use in our CRM to find a match? 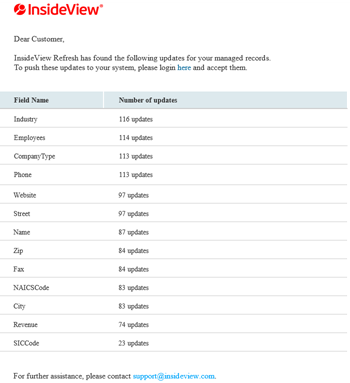 InsideView’s database contains company and contact information aggregated from more than 40,000 data sources. We use our proprietary algorithm to match the information in our database against searches by our users and information in our customer’s CRM. For more information, read the article Understanding Match Rates on our Knowledge Base. What types of email notifications does InsideView Refresh send out? InsideView Refresh sends out three types of notifications. Every time a filter runs, there is a notification that lets the user know that matching is completed. A “digest” of all the updates that InsideView Refresh is able to provide. Note: InsideView Refresh will send a weekly digest of updates on every Monday based on the number of filters that you have created to receive updates. For example, if you have created five filters in your InsideView Refresh account, then five email notifications will be sent on every Monday. All administrators who have accessed InsideView Refresh will receive update email notifications. Every time an InsideView Refresh subscription exceeds usage limit for their account(s). How does Match Score work in InsideView Refresh? First, Insideview Refresh communicates with InsideView for Sales, and detects any manual matches set in the Salesforce account narrow mashup. Any match found this way gets a match score of 100. 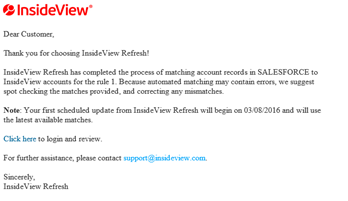 InsideView Refresh users may manually change the match for any account if they wish. If this is done, the match status will change to “matched” and the match score will be 100. If we have identified a minimum match score that we're comfortable with, but do not want the rest, what do companies typically do with the rest of the data? There are really two choices. The first is to manually match the companies over time, to ensure a good match. The second would be to modify or create a new filter to exclude those companies. Note: InsideView Refresh may find a better match in the future, so excluding those companies may not be necessary. What does the “old value” mean in the updates section? The “Old Value” is the last value supplied by Refresh. The first time a Filter is completed, the “Old Value” will be blank, because Refresh has nothing to compare it to. Are the updates showing me everything that was updated or just what I have decided to flag? The updates will only appear in the Updates section when they have been set to “Flag Only” or “Overwrite if Blank” (and then only if the field was blank). Updates set to “Overwrite” do not appear. InsideView strongly recommends the use of field level auditing in Salesforce, if users select the “Overwrite” option. Can we push updates into custom fields? Yes, you can. As long as the field is mapped and there are updates to be supplied. What happens if I have duplicate accounts in my CRM, does InsideView Refresh push data into both accounts? InsideView Refresh allows more than one account to be mapped to the same InsideView Match/InsideView ID. As a result, you are able to get data pushed into duplicate accounts. When can I expect to see updates? If you chose ‘Push Updates Now’ the updates will be pushed to your instance immediately. If you chose ‘Push Updates Later’ the updates will be pushed according the frequency interval. Does InsideView Refresh look for new matches every time a filter runs? Yes, in addition to checking for updates, InsideView Refresh checks for company matches when a filter runs. This is to find any new companies that match the filter criteria, and to make sure the best possible match is used for existing companies that are already managed by the filter. Will I lose all my existing filters that I have created? No, you will not lose your existing filters because InsideView Refresh will retrieve them automatically. Will I have to rematch my accounts? No, you don’t have to rematch your accounts. Once you edit a filter and select the option to manage contacts within your accounts, the contacts will be managed whenever that particular filter runs the next time. Do I have to remap all the fields in the Field Mapping screen when I edit an existing filter? Your account field mapping settings will not have to be remapped. However, You will have to map fields for contact data, as those are for demographic data. Do I have set the Match Score and other settings for existing filters after installing new InsideView Refresh package? No, the existing settings for Accounts wouldn't get impacted. However, you will have to configure the Match Score for receiving contact matches. Why do I see inconsistent matches for companies in InsideView Refresh for Salesforce CRM? The S-Control component stores and passes a 15-character length alphanumeric Org ID which is used by InsideView Sales to map the correct company in the InsideView database. InsideView Refresh does not accept the S-Control IDs, as it uses 18-character length Org ID that Visual-Force supplies. This leads to the company mismatch issue. Workaround: To resolve this inconsistent company matching, ask your administrator to migrate Salesforce CRM to Visual-Force based component for InsideView Sales integration instead of S-Control. What Fields in Salesforce CRM can I use to create filters from? InsideView Refresh can use standard and custom fields to create filters. You can map a custom field to a standard field in InsideView Refresh. For example, you can map a standard field "Billing Country" to "Shipping Country for IV" custom field in Salesforce CRM. Both fields should be defined with the Text datatype to allow field mapping between them. Note: If you choose Record Type as datatype for any field in Salesforce CRM, then those fields are not supported by InsideView Refresh in filters. Because, the Record Type is a composite datatype such as Reference, Address, and Other fields. What are the types of problems that might cause accounts to the failed status? InsideView Refresh and Salesforce CRM track errors codes that occur when an unexpected behavior is triggered between the two systems. When these errors cannot be overcome, the accounts are set to failed giving you feedback that a problem is present. While it is difficult to list every possible error, there are two examples of errors that can cause failure. The first is a custom validation rule, which can prevent InsideView Refresh from writing to fields in your Salesforce CRM. There are many type of custom validation rules. Go to Set up > Accounts > Validation Rules to view the custom rules. Another reason why accounts can fail is the visibility status of specific fields, which must be set using field-level security settings in Salesforce CRM. You must mark MatchedStatus and LastUpdatedByIVInsideView custom fields and make sure that all the standard fields in Salesforce CRM as visible, as well as any custom fields you have mapped in InsideView Refresh. To learn how to set field-level security settings, read the article " Granting Access to InsideView Refresh for a Standard (Non-Admin) User in Salesforce CRM" on our Knowledge Base. Why does an access token expire? In case Salesforce CRM integrations it can happen only if there is an explicit change in permissions in the CRM. An access token can also expire if your administrator revokes your access to SOAP/REST API permissions in your CRM. Does InsideView Refresh run on server time or my local time? InsideView Refresh runs on Pacific time, however the time displayed in “Set Frequency” is your Salesforce CRM's organizational machine time, and is converted to Pacific Time automatically. Can I roll back a job or roll back changes to individual fields? Although InsideView Refresh does not allow you to roll back changes to individual fields currently, Salesforce has field level audits that can be used to roll back accidental changes. This can be cumbersome, and for this reason it is best practice to periodically make a backup copy of your Salesforce data. Can anyone access InsideView Refresh, and where does the InsideView Refresh product show up? By default, InsideView Refresh can only be accessed by administrators, which is highly recommended by InsideView. The administration page for InsideView Refresh is a standalone web page, outside of the Salesforce instance. It is worth mentioning that InsideView Refresh does install a managed package into Salesforce. Do I have to add all InsideView industry values to the Industry field in Salesforce CRM? No, you don't have to add all the InsideView industry values. Salesforce CRM allows you to push values outside the picklist to the Industry field. The exception to this is a restricted picklist, which only allows specific values. Click here for a complete list of InsideView’s industries. Do I have to uninstall the old package first and then install the new InsideView Refresh package to receive contact matches? Yes, you need to uninstall old application and install the new package to receive contact matches from your managed accounts. You can also push the contact updates directly to your Salesforce CRM. On which contacts does email validation work on? 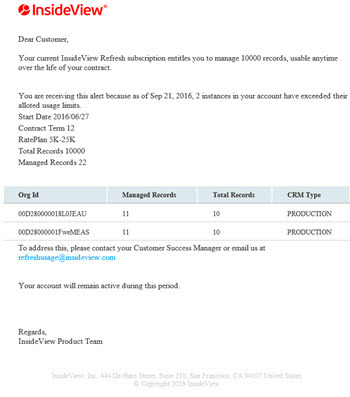 In Salesforce CRM, as long as a contact is managed by InsideView Refresh, and has an email address, InsideView will attempt to validate that email. It means that even contacts which are not "matched" can at least have the confidence that the email has been validated. Why can email validation only be done twice per contract, but I can run Refresh as often as I want? 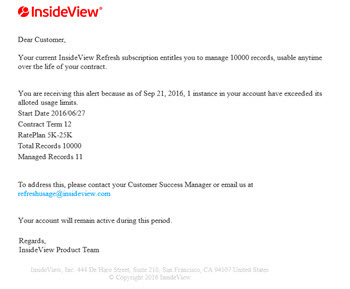 InsideView's contract with StrikeIron allows a limited number of email validations. If your company wants to validate more twice in a contract year, please contact your InsideView salesperson or customer success manager as it is possible to purchase additional validations through InsideView. Why does an email shows up as "Valid" even though employment status is "Past"? There could be a Title change for an executive, which makes the employment status as Past. In this case, the email address remains Valid. Sometimes an email address could remain active even after the executive moves to a new company. In this case, the email address is still deliverable and hence the email validation would be reported as Valid. Note: The Valid email status only indicates that the email is deliverable irrespective of the employment status and it is not directly correlated. An access token expires due to NO active usage of your Microsoft Dynamics account. To mitigate this inactivity issue, you must login to your Microsoft Dynamics CRM instance once in every 14 days. Why don't I see the option to manage contacts and email validation using Refresh with Microsoft Dynamics? Currently, InsideView Refresh does not support managing contacts and email validation for Microsoft Dynamics CRM. The support for managing contacts in Microsoft Dynamics CRM is expected in 2019. What Fields in Microsoft CRM can I use to create filters from? InsideView Refresh can use standard and custom fields to create filters. You can map a custom field to a standard field in InsideView Refresh. For example, you can map a standard field "Billing Country" to "Shipping Country for IV" custom field in Microsoft Dynamics CRM. Both fields should be defined with the Same datatype to allow field mapping between them. To see what fields are available, check the filterable fields from the Create View or Edit View section in Accounts.